It's spring, which means mice in the house. We've been setting traps and getting rid of them before they can explode in population. Younger Daughter found herself hosting a family of half-grown rodents in her bedroom. Oddly enough, they had apparently not yet developed the instinct to run away, so she's been able to catch them in ... a teacup. That's all it took. Plop a teacup over the bewildered little beastie sitting in the middle of the floor, slide some cardboard underneath, and the mouse was caught. She admits mice are cuuuuute -- but not in one's bedroom. Or any room, for that matter. 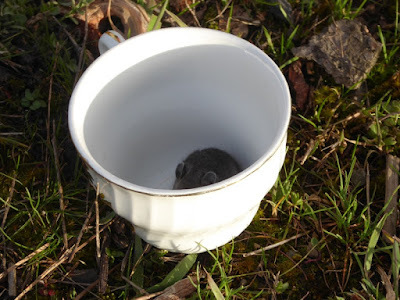 Using this same teacup, she managed to catch SIX half-grown mice over a period of 24 hours, which she released out by the woodpile (and yes, she washed the cup thoroughly). We caught five more mice in traps, and Lydia killed one more. So far so good: I think we won. When my kids were younger, they often had hamsters as pets. When one would escape, I used the glass jar from an old blender to improvise a trap. I removed the blade assembly and turned the glass jar upside down on a piece of plywood larger that the jar. I then would bait the trap with a little peanut butter or small piece of cheese. An old decorative pillow propped up against the side of the jar for climbing and within no more that 24 hours, the hamster would be captured. I often thought this would work with mice, too, just never had to try it yet. At least it eliminates the "active" nature of the teacup trap! Younger Daughter is doing a better job of mouse catching, than any-old CAT!!! Way to Go!! Meanwhile...since I moved into my new old farmhouse...I have had to deal with 3 (( gulp )) LIZARDS!! Oh the horror!!! I won't tell you how I deal with'em...the violence is too horrific. Does ANYONE know an effective method for getting lizards out of the house??????? I grab them by the tail, admonish them for not helping pay the mortgage, then toss them out the door. Our Georgia lizards and skinks are pretty small, though: not more than 5 inches,of which about 2 inches is the tail. They are cute. My kids always had pet rodents, from gerbils to guinea pigs. They had a rat that was very smart and would ride around on their shoulder or in a breast pocket. Unfortunately for the cute rodents, I do NOT want them peeing in my sock drawer, eating my food in the cupboards, pooping in my linen closet or nesting and indiscriminately breeding in my book collection. The spreading of diseases is a whole 'nother discussion. Therefore, they gotta go. If I accidentally catch them alive, I also put them out near the woodpile. But I call the cats and show them where they went. Better than my Dad who once threw a combat boot at one and smeared it across the kitchen floor! You better believe that was one mess my Mom did not clean up! I know people who put some food in a bucket and lean a board up to and over it. A little water will prevent the mouse from jumping out; a lot of water (or if you feel nasty antifreeze) will drown the mouse. 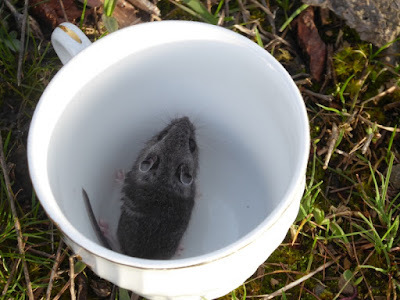 This past January I had a 3 day weekend in which I caught 6 mice...all full size, all in the kitchen, all while I was sick with the flu or plague or whatever it was...I wasn't cooking, that was for sure, so there were no dirty dishes or food around. Don't know why I was invaded, but boy, was I. None since. Just weird. We struggled with mice for years (twenty!) in our old farmhouse. Peppermint essential oil did drive them away but then I'd forget to use it and back they would come. Best thing we ever did was build our little grain bin house with concrete floors and only ONE DOOR to come in and out of. No mice yet, after two years. Paws crossed. I inherited a small sausage chihuahua and she is a remarkable mouser, she has caught about 10 so far this year in the house and yard, way better then a cat! I am dealing with rats coming in. I did put a slice of Irish Spring at one place, but the rat came in a different way. I put shavings of Irish Spring and rat poison in one hole I cannot mend and no more rat. I am bringing in my five-gallon rat trap tomorrow. Cashmere Bouquet works, too, but it is discontinued. steel wool shoved in a hole also works to block them. Every homestead needs a small Rat Terrier! (they come in three sizes) Bred as a hunting dog for rodents on farms. They don't eat much, have a calm, pleasant disposition, will dig up gophers and live to hunt mice and rats. I ended up with one that wandered in as a stray puppy--thought I had a chihuahua until his true identity was determined--and now he's joined up with the barn cats to hunt mice. The cats are bigger than he is. He's not a bird dog: big covey of quail ambled past the porch and he watched them go by, just wasn't interested in chasing birds. He's also a good watch dog: barks at strangers and even sounds the alarm at hawks and coyotes, but friendly with small children. Worth his weight in gold. Absolutely... Rate Terriers are better mousers than many cats! When you catch a mouse, feed him to your chickens. Mine love them! Our home is in the middle of a cornfield. I deal with mice all year round. My secret weapon is my tuxedo cat. 31 mice and counting so far. He's a grump who doesn't like to be petted or adored, but he does the job we got him to do.